This Inflatable rock wall will go where traditional rock climbing walls won't. In the back yard, courtyard, inside a gym or areas with limited accessibility and it can support 4 climbers at once. 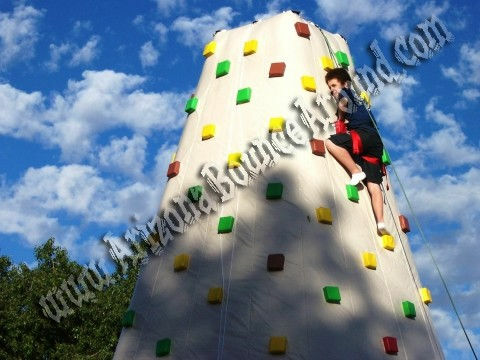 This Inflatable rock wall is 26 feet tall and awesome for kids or adults. 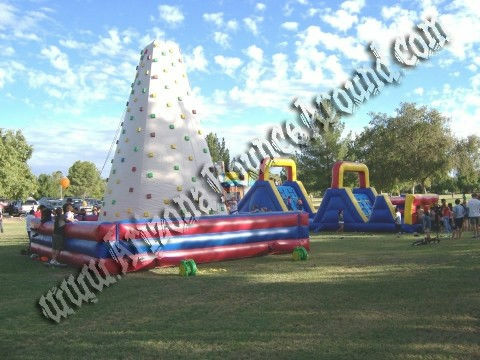 This Inflatable 4 person rock wall is a very appealing choice for any event and is much better and easier to climb that a hard rock wall. It allows a high volume of rock climbers at the same time with multiple climbing roughts. It has an inflated landing bed all the way around the bottom that gives the climbers a soft place to land and is not as steep to climb as a regular Rock Wall. Every climber has its own attendant giving that much more attention to each climber. 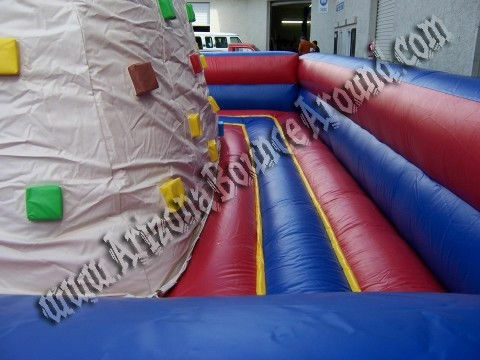 Schools and Churches love this Inflatable Rock Wall and its great for company picnics and parties. We also have portable rock walls to choose from even one with a 2 person bungee trampoline. 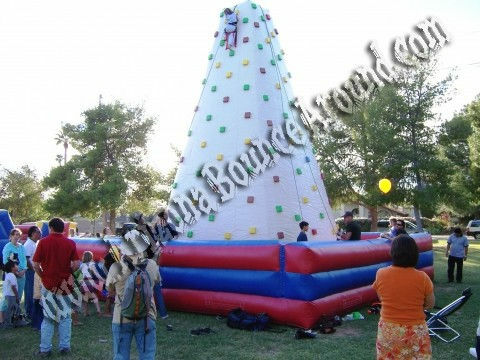 This inflatable rock climbing wall rental price includes standard set up. Standard setup is considered a real grass area that we can stake into the ground or indoors. Within 80 feet of sufficient electrical supply. Delivery and removal within included delivery area with no restrictions for delivery, set up or pickup. We do not install this inflatable rock wall on dirt or sand but it can be setup on asphalt, concrete or artificial grass by adding sand bags to your order. Be sure to check out our zip line and bungee trampoline rentals.